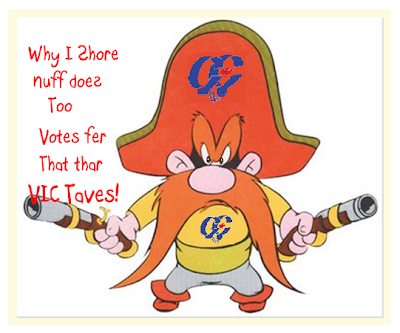 The Twain Shall Meet: I Am Worried for Vic Toews ~ He Really Needs a Rest! 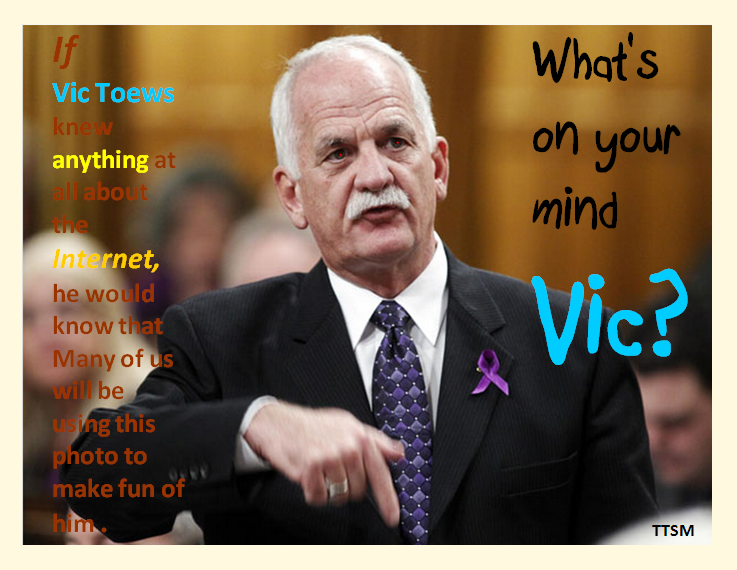 I Am Worried for Vic Toews ~ He Really Needs a Rest! Just keep on a Readin' Varmit! There is a Test at the End. Vic Toews is quickly becoming someone that those of us who are already openly opposed to Stephen Harper's Government look to every day and find for yet another reason to stop the insanity that is Harper Land. Vic, as a leader of men is a failed experiment to say the least. He is ill cast to carry the burden of the role of Sheriff of Harper Land. 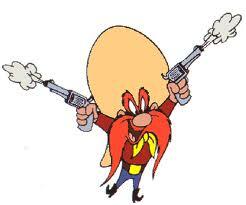 Like Yosemite Sam here, he lacks the wits or the temperament needed to be successful as our protector. Things are always odd in Harper Land to say the very least, and it is obvious to those of us who are really paying attention that the Treasury board Chairman is a threat to the Treasury, the Minister of the Environment is a threat to the Environment, the Minister in charge of Immigration is a threat to our Department of Immigration, etc. In fact it is painfully obvious that in Harper Land, any minister currently in Charge of any and all departments is counter productive and this amateurish and indolent government are failing miserably to manage any of them. So, how you holding up, eh? Let's Start with This: Vic Toews just last week, blithely reported to the members of the House of Commons that he had already advised the Canadian Security and Intelligence Services (CSIS) that it will be OK in the future to use information that has been gathered through the imposition of torture. And this is just a start! see a High Divin' Act"
So what has he done lately that adds to the list of incompetence and drudgery that is the Harper style of governance? Well for one thing he is denying that an internal report is clearly saying that the termination of the long gun registry is a huge mistake, and that it will result in a lot more illegal guns in Canada and on the streets. He has also come out on the side of armed citizens having weapons at the ready to defend life and property. Yeeeee Haaa! Texas Lives! Vic Toews, Our Public safety Minister, has just made Canada a hell of a lot less Safe. Like I said above, not only are these guys bad at what they do, they each are thriving while doing actual harm in their own field. Never has such a group of Dullards and amateurs had so much clout anywhere in the world. It is almost hard to imagine the collective lack of talent in the Harper Regime. And Today, (Feb 14th) It Got Even Worse. He is Having a Very Hard Week! OTTAWA ~ The government says anyone who opposes federal plans to make electronic surveillance easier for police and spies is siding with child pornographers. It’s the first salvo in a battle that will resume Tuesday when the government reintroduces legislation that would expand online monitoring powers. The issue pits the desire of intelligence and law-enforcement officials to have easier access to information about Internet users against the individual’s right to privacy. Asked Monday in the House of Commons about the coming bill, Public Safety Minister Vic Toews told a Liberal MP he could either "Stand with the Government or Stand with the Child Pornographers"
What on Earth is your Point? Privacy Commissioner Jennifer Stoddart has warned against simply resurrecting a trio of previous federal bills to expand surveillance powers, citing several shortcomings. Of particular concern to the privacy commissioner are provisions that would allow authorities access to Internet subscriber information without first getting a court’s go-ahead. Toews’ office has assured that the government will strike a suitable and appropriate balance between the necessary investigative powers and the protection of privacy. Personally I am not sure that I imagine that really happening. And certainly not with the outspoken and intellectually over-matched Teows calling the shots. Opposition MPs were Alarmed by his Inane Comments. “Apparently if you care about civil liberties in this country you obviously side with child pornographers, murderers. You’re the worst form of scum if you believe the charter’s an important instrument for the rule of law in this country. I'm horrified by this kind of rhetoric. It demeans us all.” ~ Elizabeth May. "Stupid" was the word that Bob Rae used to describe the Statement and the Minister. I will provide a link as soon as I inherit a secretary. Lol! Note that Bob Rae is only referring to 'Hitler' because it had come up in the HOC just a day before when one of the the Cons inappropriately and absurdly compared a statement by former Liberal MP, Allan Rock with Adolf Hitler. Vic Toews has never taken any responsibility for anything that this government has done. innate ability to put up a smoke screen. Vic Clears the whole thing up! a Head with It's Chicken Cut Off! Fabulous as usual Kim!! Wish this could be blanketed to all of Canada!! Hi there. I see that Vic is that Neo-con colour I like so much. I think he might be saying "Why's everybody always pickin' on me?" just like Charlie Brown. He does play the victim, as you are so fond of pointing out,Lol! Sometimes I think this must be a bad dream. I found this quote chilling & timely. ""The state must declare the child to be the most precious treasure of the people. As long as the government is perceived as working for the benefit of the children, the people will happily endure almost any curtailment of liberty and almost any deprivation"
Dear Mr. Harper ~ Canadians Speaking to Power.